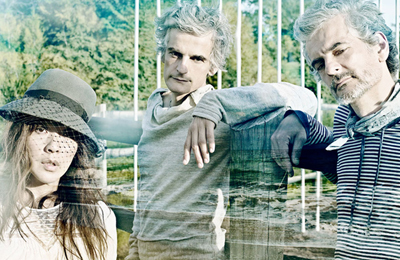 Forming in 1994, Blonde Redhead were thrown together following a chance meeting in New York between Japanese siren Kazu Makino and Milanese twin brothers, Amedeo and Simone Pace. Taking their name from a song by fellow New York no wave artists DNA, location was to prove key to the band’s initial experimentations. Forging a sound reflective of New York’s rich musical legacy, the early years of Blonde Redhead were very much haunted by the squalling underground scene that has forever pulsed throughout the city. While indebted to their geography, the release of their self-titled debut in 1994, swiftly followed by the self-produced La Mia Vita Violenta a year later on Steve Shelley’s Smells Like label, showed signs that Blonde Redhead were soon to escape the shadow of New York. Indeed, a move west to esteemed Chicago imprint Touch And Go provided the band the opportunity to stretch their wings. The release ofFake Can Be Just As Good with Fugazi’s Guy Picciotto in 1997 and it’s sequel, In An Expression Of The Inexpressible, offered gradual refinements of their artful chaos, but it wasn’t until the band’s swansong for Touch And Go, 2000’s Melody Of Certain Damaged Lemons, that a turning point was reached. The tumult and discord of their earlier records was pared back, emphasis instead placed on the windswept, minor-key melodies that have since come to be the defining trait of the band. Not long after signing to 4AD on a worldwide deal in 2004, Kazu suffered a near-fatal horse riding accident, which understandably was to colour, both visually and lyrically, their debut for the label, Misery Is A Butterfly. Four years later, they returned with their most commercially successful album to date, 23. Testament to the band’s ability to reinvent who they are without losing any of their emotional resonance, the record is a lucid reflection of Blonde Redhead’s will to connect with its audience in striking and affecting ways. Made with the intent to achieve more clarity than what preceded it, the band openly acknowledged that it wasn’t until they reached the mixing stage that they knew what shape the record was to take. They had little to worry about, as 23 was received to near universal praise.